Hey, Girlfriends … Time To Celebrate! 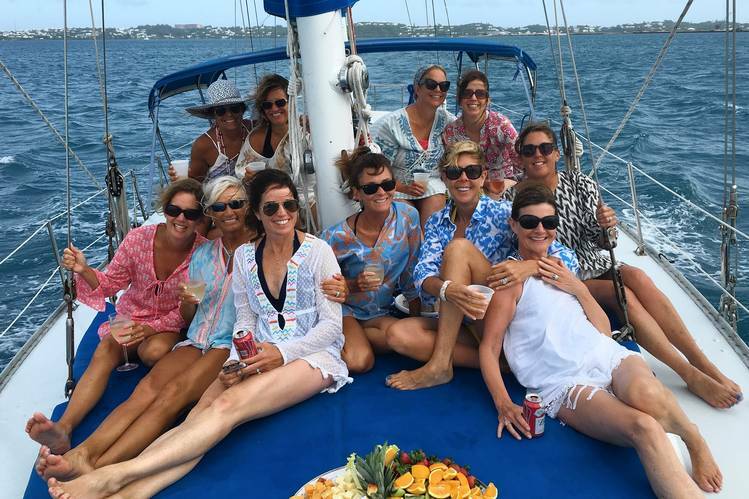 Kim Cleaves and friends celebrated turning 50 on a sailboat in Bermuda. Photo: Kim Cleaves for the Wall Street Journal. If you’re female and over 40, you know the best thing around is the girlfriend getaway. It’s all about celebrating – often far, far away – with those near and dear to you. Sometimes it’s as simple as meeting up for dinner in your hometown or spending the weekend at a beach hotel to celebrate a special friend’s significant birthday. Or, it could be indulging in a longtime dream vacation by sailing the Greek islands, restaurant hopping in Charleston, or touring the vineyards of Bordeaux. (Or if you’re my daughter, visiting Antarctica. Go figure.). How else to explain why 40, 50 and 60-year old women want to drink, share, reminisce and rediscover what they love about life and sharing good times together? What’s absolutely certain is that getting away with gal pals is catching on. “A full 75% of adults 45 and over have taken, or plan to take, one of these “celebration vacations,” according to AARP researchers cited in a Wall Street Journal article. A few years back, I crossed paths with a group of ladies in their 60s on a Scandinavian cruise (in the laundry room, of all places). We started chatting, and I learned that they had been touring together every year for decades. In fact, these ladies went to elementary school together in Hawaii and met up, each year, on a different adventure. Not everyone took part every year, but they told me how much it meant to them to catch up and renew their friendships, especially as they got older and were able to share the joys – and heartache – of marriage and divorce, illness and widowhood, the birth of grandchildren and the death of a spouse. Don’t have a group? Make up your own. Don’t let lack of your own gal posse hold you back. Last year, I joined up with a group of other women travelers for a foodie trip to New Orleans. I had always wanted to visit and got tired of waiting for the right opportunity. Our group was a congenial mix of singles, friends and sisters and together, we spent four days in the French Quarter (no extra charge for the Bourbon Orleans ghost) eating oysters, drinking exotic cocktails, and perfecting our étouffées. Traveling with a group frequented by singles is also a good solution when your significant other would rather stay home and watch football than travel. Looking for a good group? Check out our previous article on women’s solo travel. Decide how to split the costs. Everyone on your getaway may have a different budget, and you don’t want anyone to feel left out or coerced. If you’re organizing side trips and activities, make sure they’re optional, so those who are travelling on a budget (or have different levels of fitness, or just don’t want to partake) can opt out. On a Thanksgiving group trip to Santa Fe a few years ago, we chipped in to split the rental costs of a beautiful adobe house, complete with kiva fireplaces and hot tub. During the days, we indulged in some low-cost hiking. At night, we usually shopped and ate-in, including our homemade high-altitude New Mexican turkey dinner, which made for an affordable break. Don’t put it off too long. We’ve been helping clients make good money decisions for decades, which makes us pretty good at arbitrating the save vs. splurge debate. We’re big believers in saving for tomorrow, but can also appreciate the arguments in favor of living life to the fullest. So go for the happy medium. Don’t put off that trip or celebration, especially the more adventurous ones. It gets harder to pull those off as you age, and sitting in the economy section of a 16-hour flight may not have the same charm at age 58 that it did at 28. On the other hand, unless you’re a hard-core bon vivant, ask yourself whether you really need a five-star hotel every single night. It’s all about the company, not the cost. ← Just how big is the student debt problem?